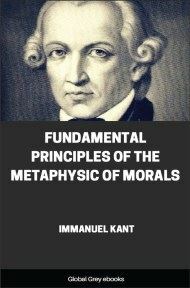 Groundwork of the Metaphysic of Morals (also known as the Foundations/Fundamentals of the Metaphysics of Morals, Grounding of the Metaphysics of Morals and the Grounding for the Metaphysics of Morals) is the first of Immanuel Kant's mature works on moral philosophy and remains one of the most influential in the field. It is broken into a preface, followed by three sections. 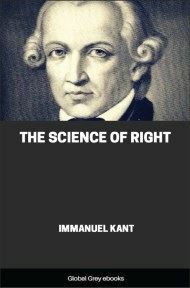 Kant's argument works from common reason up to the supreme unconditional law, in order to identify its existence. He then works backwards from there to prove the relevance and weight of the moral law. The third and final section of the book is famously obscure, and it is partly because of this that Kant later, in 1788, decided to publish the Critique of Practical Reason. 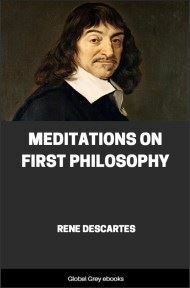 We may call all philosophy empirical, so far as it is based on grounds of experience: on the other hand, that which delivers its doctrines from a priori principles alone we may call pure philosophy. 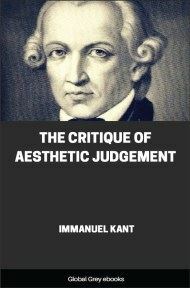 When the latter is merely formal it is logic; if it is restricted to definite objects of the understanding it is metaphysic. 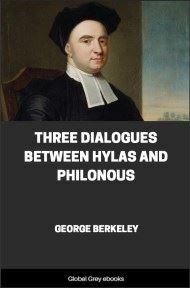 In this way there arises the idea of a twofold metaphysic — a metaphysic of nature and a metaphysic of morals. Physics will thus have an empirical and also a rational part. It is the same with Ethics; but here the empirical part might have the special name of practical anthropology, the name morality being appropriated to the rational part. All trades, arts, and handiworks have gained by division of labour, namely, when, instead of one man doing everything, each confines himself to a certain kind of work distinct from others in the treatment it requires, so as to be able to perform it with greater facility and in the greatest perfection. Where the different kinds of work are not distinguished and divided, where everyone is a jack-of-all-trades, there manufactures remain still in the greatest barbarism. It might deserve to be considered whether pure philosophy in all its parts does not require a man specially devoted to it, and whether it would not be better for the whole business of science if those who, to please the tastes of the public, are wont to blend the rational and empirical elements together, mixed in all sorts of proportions unknown to themselves, and who call themselves independent thinkers, giving the name of minute philosophers to those who apply themselves to the rational part only — if these, I say, were warned not to carry on two employments together which differ widely in the treatment they demand, for each of which perhaps a special talent is required, and the combination of which in one person only produces bunglers. 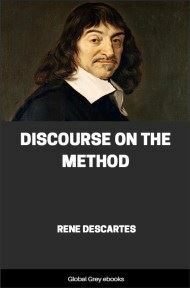 But I only ask here whether the nature of science does not require that we should always carefully separate the empirical from the rational part, and prefix to Physics proper (or empirical physics) a metaphysic of nature, and to practical anthropology a metaphysic of morals, which must be carefully cleared of everything empirical, so that we may know how much can be accomplished by pure reason in both cases, and from what sources it draws this its a priori teaching, and that whether the latter inquiry is conducted by all moralists (whose name is legion), or only by some who feel a calling thereto.